For this episode of the Sophisticated Marketer’s Podcast, I thought it would be interesting to step away from straight marketing talk and go more to the creative side of things. I had a hunch that an indie musician would have some insights that transfer to marketing, and that hunch paid off amazingly well. My guest this time around is singer-songwriter Julian Velard. Julian’s a New York native who was discovered on MySpace, spent a while recording for a major label, and is now a successful independent artist. 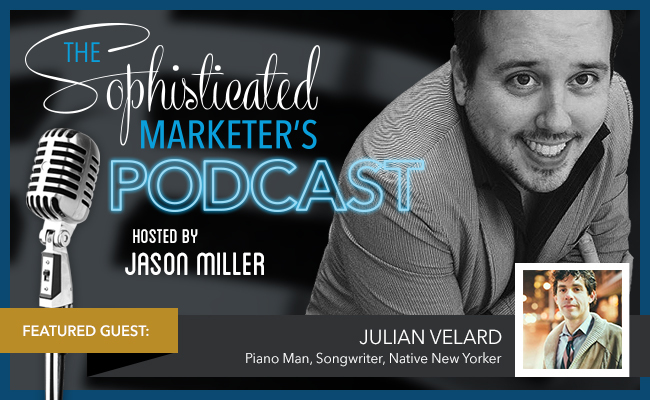 Julian built his music career through engaging storytelling, knowing and interacting with his audience, and projecting authenticity—all of which are also building blocks of great marketing. To further blur the lines between music and marketing, Julian’s music video for the song “No One’s Getting Married Tonight” was secretly shot by Julian’s friend Jim Glaub of legendary New York ad agency SERINO/COYNE. I recommend you watch the video before you listen. It’s essentially a great piece of content marketing (and the tune’s catchy, too). Now that you’re properly prepped, pop on your very best noise-canceling headphones and download the podcast below. You will learn how to find the balance between playing it safe and experimenting, how authenticity helps build a loyal fan base, and why Billy Joel and Neil Diamond are good role models for both marketers and musicians. How to Realize a Good Idea without Spending a Fortune: Julian discusses the process of making the “Nobody’s Getting Married Tonight” video, and how its narrative and authenticity helped it find an audience. 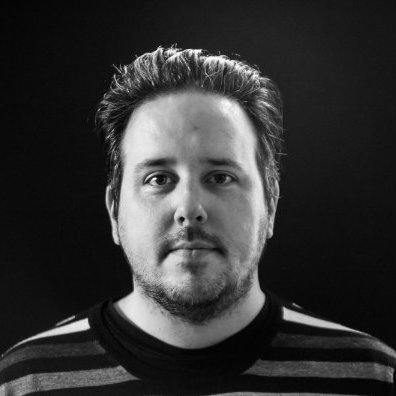 Staying Authentic on Social Media: While acknowledging that self-promotion is the goal on social media, Julian tries to, in his words, “do it without being a total jerk.” His messages resonate because he puts his actual personality into them—no trite, canned messaging. Resonance + Platform: Mediocre content can hit with an audience if you have a huge platform to promote it. Without that boost, you have to create content that resonates and build the platform yourself. Julian talks about slowly building up his platform through music that resonates with his audience. Crowdsourced Everything: Julian’s last album, If You Don’t Like It, You Can Leave was crowdfunded, and most of his tours are crowdsourced as well. He talks about what crowdfunding enabled in terms of creative freedom and connection with fans. Julian’s music is pretty great, and his dedication to keeping it real is inspiring to musicians and marketers alike. You can find out more at Julian’s website, or follow him on Twitter @julianvelard. Thanks for tuning in! If you’re just discovering the podcast, you can catch up with all the previous episodes here. Subscribe to the podcast now to stay current with all the discussion by Sophisticated Marketers for Sophisticated Marketers.